Declaring victory after a nine-year effort, biologists have found 6,144 species of arthropods — insects, spiders and crustaceans (water critters like crabs) — on less than half a hectare of lowland rain forest in Panama. 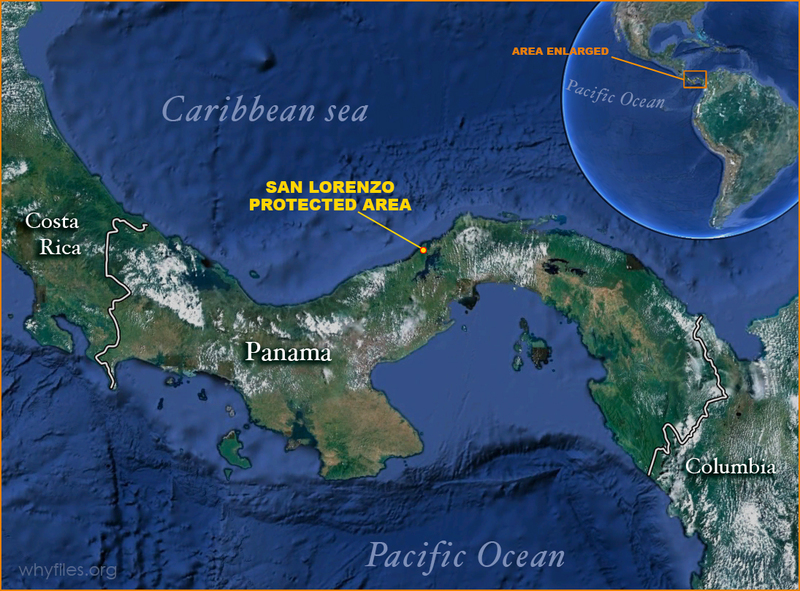 Using technologies high and low, the entomologists swarmed over plots in the San Lorenzo Protected Area in 2003 and ’04. Their collection likely represents about one-quarter of the 25,000 arthropods on the 6,000 hectare (15,000 acre) reserve, says Yves Basset, first author of a new study in the journal Science. Collecting and counting insects and their relatives may sound easy, but it’s not. For one thing, a major proportion live in the canopy, 30 or more meters above the ground. 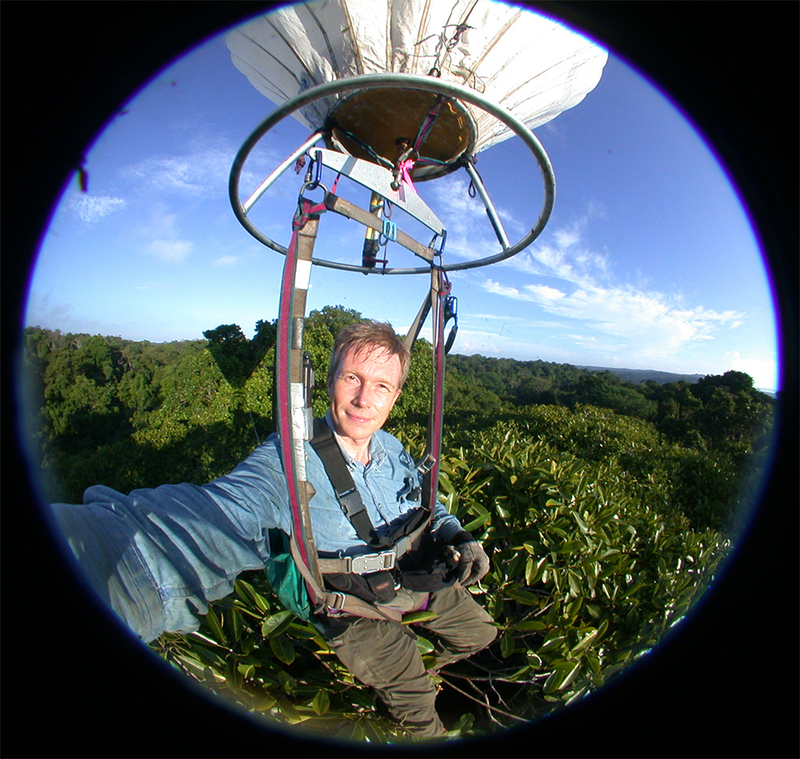 The study plots in the Panamanian forest were sampled by spraying insecticide, climbing trees, floating in a hot-air balloon and even hanging from a giant crane operated by the Smithsonian Tropical Research Institute. Each study plot was 20 meters square, for a total size of just under half a hectare. Image courtesy of Jürgen Schmidl. Copyright University of Erlangen, used with permission. 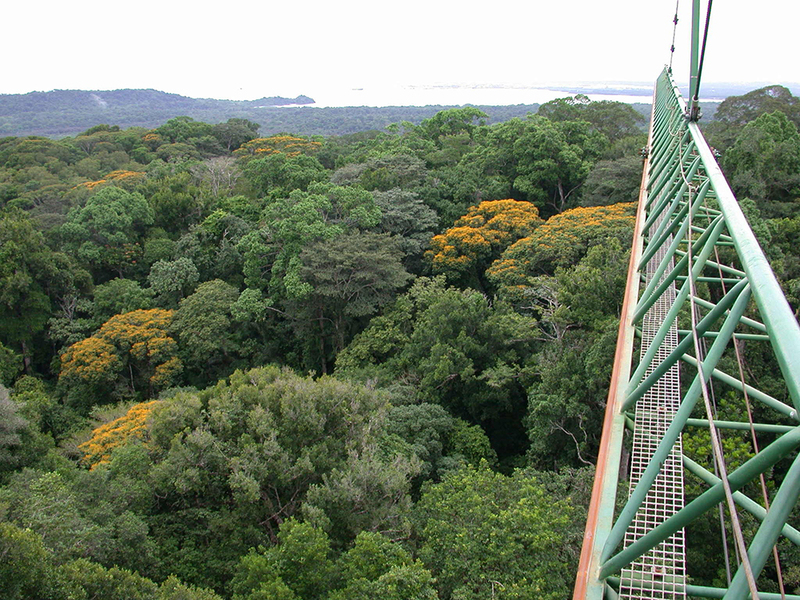 A lot of forest: In this view from the canopy crane in San Lorenzo, notice the orange-flowered trees. Says the spider: Have we met? A second obstacle arose after sample collection. Insects, spiders and crustaceans are poorly known, so 100-odd researchers spent years comparing specimens in museums, says Basset, an entomologist with Smithsonian in Panama. When identification is complete he expects the new collection to contain hundreds — possibly thousands — of new species. Image courtesy Jürgen Schmidl, copyright University of Erlangen, used with permission. 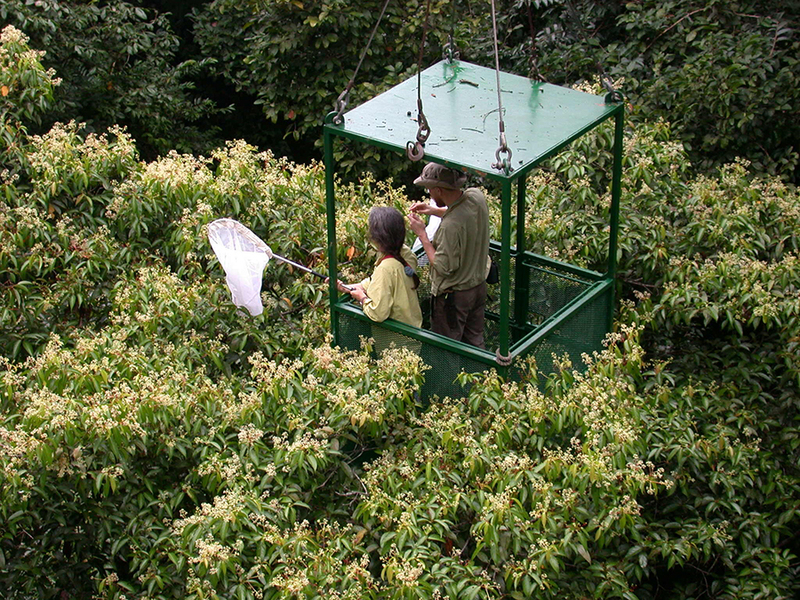 Researchers net insects attracted to flowers of Nectandra purpurascens trees from the crane gondola. And rare species, by definition, are harder to find. Intriguingly, the species richness was two to eight times higher than in a temperate forest, “far lower than many previous estimates,” the authors wrote. Forests in the Peruvian Amazon may contain much greater arthropod diversity, Basset says. Can we throw it all away? 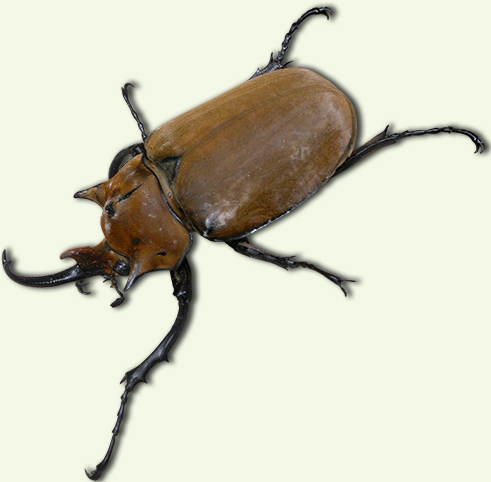 Megasoma elephas, a scarab beetle, lived in the San Lorenzo understory. In 2009, one estimate said that about 32,000 hectares of tropical forest were destroyed each day. Image courtesy Roger Le Guen, copyright Panacoco, used with permission. Raining bugs? 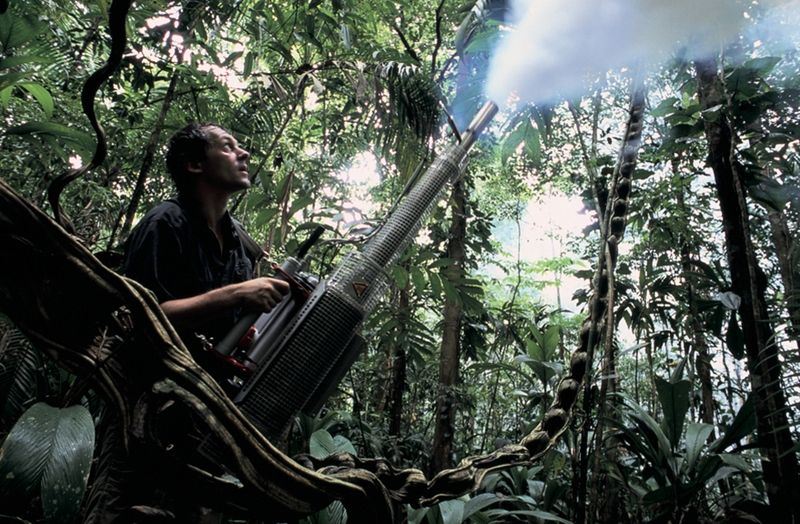 Jürgen Schmidl fogging with insecticide in the San Lorenzo forest.